Follow this guide to keep things cool during a big haul. 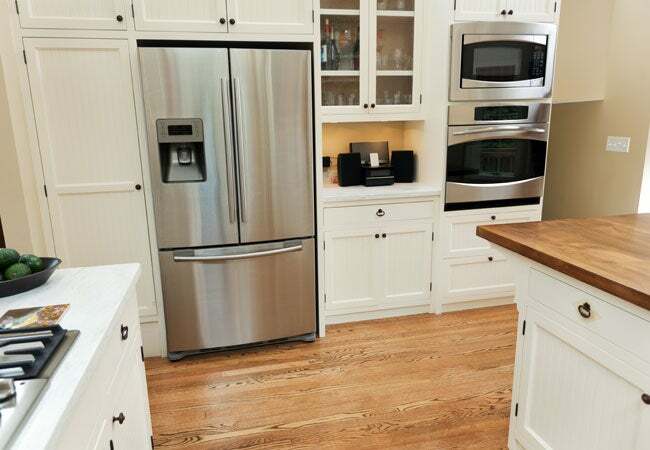 When you’re starting out in a new home or renovating the kitchen in your current one, the time may come when you must figure out how to move a refrigerator. With fridges weighing in anywhere between 150 and 350 pounds, doing this job incorrectly can result in bodily injuries, scratched floors, even a broken fridge. So get a helper (this is absolutely a two-person job! 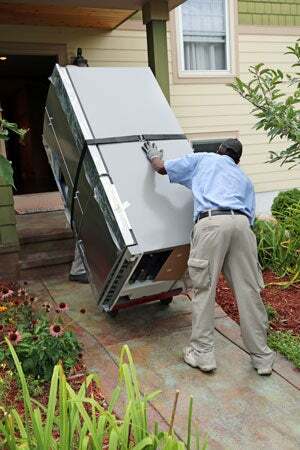 ), rent an appliance dolly from your nearest hardware store, and follow these steps—applicable to any kind of fridge, from side-by-side and French door models to those with the freezer on top or bottom—to make the move easy and safe, without any spoiling any food, straining any muscles, or losing your cool in the process. First, empty the fridge. Whether it’s across the room or the country, when you’re moving a fridge from point A to point B, the last thing you’ll want is for those soda cans and pickle jars to rattle around and break open along the way. What’s more, you’ll want to avoid the spoilage that can easily occur if you leave food in an unplugged fridge. Store perishables in an insulated picnic cooler or two, and throw in a few frozen bottles of water for added peace of mind. Next, remove any ice cube trays, movable shelves and other accessories that might shift “mid-flight,” and be sure to take down those magnets and other decorative elements from the exterior. Unplug the refrigerator from the wall. If you have a built-in icemaker, disconnect the fridge from its water source as well. Gather the cords up in a coil and secure them tightly with a zip tie or a few loops of painter’s tape (masking tape is also an option but may leave adhesive residue). Allow 6 to 8 hours for the interior to defrost completely; if you skip this step, you’ll run the risk of the fridge’s interior growing mold or even leaking all over the moving truck while in transit. Tip: Unplug the night before a move or reno so everything’s ready to roll in the morning. Once the interior reaches room temperature, use a towel to wipe away any melted frost from the freezer drawer. Wrap two or more all-purpose bungee cords around the appliance like belts—one around the upper half and one around the lower half—to keep the doors closed when you move the refrigerator. If you don’t have bungee cords, two long rolls of plastic wrap secured tightly around the fridge can do the trick almost as well; be sure to get a snug fit and tape off the ends to reinforce. If possible, tie the door handles together as well to make sure everything stays firmly in place during transport. Roll up the dolly (typically available for rent from reputable hardware stores for about $15 a day) and gently center the tow blade under the bottom of the fridge, approaching it from the side with the fridge doors at a 90-degree angle from the back of the dolly. Note that you should never, ever lay a fridge on its side or back to move it because tipping it too far in the wrong direction can cause a coolant breach, reducing your fridge to little more than a big, broken metal box. But using an appliance dolly correctly, you’ll be able to tilt the fridge slightly sideways to move it without leaning it too far over. For this two-person job, one person will position the dolly underneath the fridge and stay behind it with hands on handles, keeping it in place. The tow blade should just slide right underneath the appliance without having to be forced. Now, the helper uses the dolly’s straps to lock it down by encircling the refrigerator’s body like a belt, similar to the way you secured the doors closed with tape or plastic wrap. If the dolly has a ratchet mechanism (found on its back), use that to pull the strap tight and keep the fridge securely fastened to the dolly itself while it’s moving. If there’s no ratchet, tie a tight double knot, anchoring it to the steel ribs between the dolly’s handles. Position yourselves so that one person is standing behind the dolly, holding it by both handles to guide the movement, and the other is standing in front of the doors, able to react quickly in case anything hasn’t been secured correctly and the fridge starts to slide or the doors begin to open. Together, slightly tilt the fridge and dolly back between 20 and 45 degrees—just enough for the wheels to move freely when the person holding the dolly’s handles gives it a gentle push or pull, depending on whether you need to move forward or backward. When you and the fridge are steady, slowly begin work your way to the moving truck (or simply out of the way, in the case of a renovation). Be sure to keep the appliance tilted no more than 45 degrees for the entire journey and take caution as needed while navigating around corners, through doorways and up or down ramps of any kind. It’s critical to never lay or carry your fridge on its back or side, since doing so can create an irreparable leak in the cooling system and prevent the appliance from doing its job once you plug it back in. It’s also unsanitary to move a refrigerator while it’s still cooling down and filled with condensation, creating a playground for mold and bacteria. So do your prep, take your time, and be sure to use a large enough dolly to get the job done safely. After following these easy steps for how to move a refrigerator, you’ll be chilling in your new kitchen in no time flat.